Finally, Microsoft took the covers off the much talked about Origami Project. There was intense speculation in the media that it is either a iPod killer or a Blackberry killer, but as it turns out, it is neither, it is a hybrid of iPod & blackberry minus the phone aspect and much bulkier and pricier. Microsoft calls it Ultra Mobile PC. It weighs about 2 pounds and priced around USD 1000. 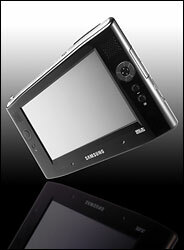 It can do wi-fi, play audio, video and do all the usual PDA stuff. First look, I am skeptical about this device. It is neither here nor there (iPod / Blackberry category). Also it is bulkier and cannot be carried in our shirt, pant pocket. Most importantly it is priced on the higher side outside the acceptable price band. Hey, I can get a decent laptop under USD 1000 these days, why would I go for this one?